← Breast Cancer Doesn’t Discriminate! In advance of the U.S. Senate Foreign Relations Committee’s hearing today on the United Nations Convention on the Rights of Persons with Disabilities (CRPD), The Arc is urging the Senate to support this treaty because it is the right thing to do for American citizens with disabilities who travel abroad and for the millions of people around the world that currently don’t have the rights that we enjoy through our long history of disability rights advocacy. “This treaty is modeled after The Americans with Disabilities Act, which affirms the rights of American citizens with disabilities by prohibiting discrimination in employment, public services, public accommodations and services operated by private entities. The Senate’s failure to pass the Convention on the Rights of Persons with Disabilities last year marked a sad day for individuals with disabilities across the globe and an embarrassing moment for our nation. “Today’s hearing is an opportunity for us to fix the wrongs of last year and join more than a hundred other nations, millions of disability advocates, family members, and self-advocates in supporting the human rights for individuals with disabilities internationally. We will be following this process closely, and hope to see the Senate move forward with the CRPD,” said Peter Berns, CEO of The Arc. Over the last year, The Arc has been working with numerous disability, Veteran’s, and civil rights advocacy groups to garner support for ratifying the treaty, which will promote, protect and ensure the full and equal enjoyment of all human rights and fundamental freedoms by all persons with disabilities. For months, The Arc’s Public Policy team and grassroots advocates across the country have been working to promote the CRPD and ensure ratification. Currently more than 650 local, state and national disability and allied groups support the treaty. The United States signed the CRPD on July 30, 2009, joining the 141 other signing nations. As of October 2013, the Convention had 138 ratifications and 158 signatories. On May 17, 2012, following almost three years of thorough review, the Obama Administration submitted its treaty package to the U.S. Senate for its advice and consent for ratification. On December 4, 2012, the United States Senate considered the ratification of the CRPD but fell 5 votes short of the 66 needed – two-thirds of Senators who voted. 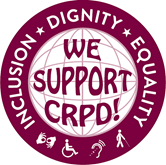 This entry was posted in Advocacy and tagged civil rights, CRPD, treaty. Bookmark the permalink.